Where Can I Find The Cost Of Braces For Adults Near Me? Our team at Glaser Orthodontics are experts in orthodontic care including adult braces and Invisalign in Yorktown NY. As a leading Yorktown orthodontist, Dr. Glaser is experienced and knowledgeable in all aspects of dental care. As a result, we offer free consultations to all new patients, which provides an opportunity to evaluate your needs and goals. What Is The The Cost Of Braces For Adults? The average cost of braces for adults is different for each patient. The cost of braces for adults is dependent on specific individual factors such as the location of treatment, the complexity of issues to be treated, and the number of visits required with an orthodontist. However, the cost of braces for adults in Yorktown, NY may be cheaper than surrounding areas of Westchester County such as higher income neighborhoods or larger cities. 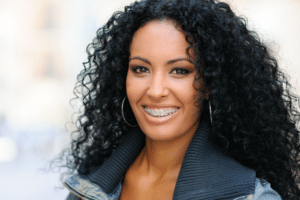 Is There An Age Limit For Adult Braces? No, there is no age limit to get adult braces! We have treated patients in their 60’s and even 70’s who prove it is never too late for a healthier smile. As long as your teeth are suitable for treatment, age is never a factor with orthodontic treatment. What Are The Benefits Of Braces For Adults? 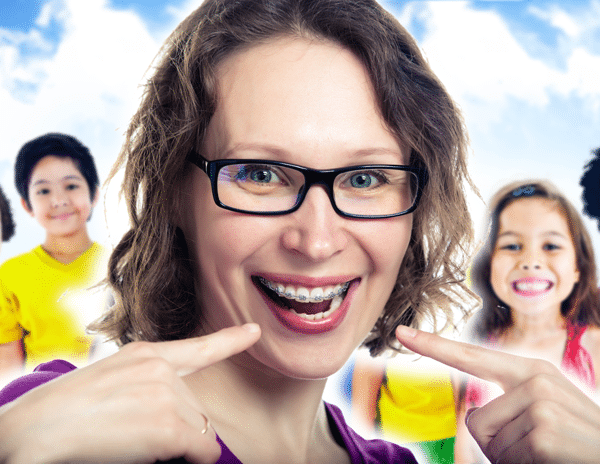 How Do Kids’ Braces Differ From Braces For Adults? Adults receive the same benefits from orthodontic treatment; a beautifully straight and properly functioning smile. However, there are some things that may be slightly different. Adolescents have the benefit of a growing jaw to aid in tooth movement, while an adult jaw has stopped growing. As a result, orthodontic treatment may take longer or require jaw surgery to achieve the desired results. Does My Insurance Cover The Cost Of Braces For Adults? If orthodontic treatment is included apart of your insurance coverage, you may receive the benefits of reduced out-of-pocket-expenses. Our goal is to make treatment affordable for all patients. As a result, we accept most major insurance providers. During your initial visit, we will discuss all the available options in order to decide the best choice of braces or Invisalign for you. Dr. Glaser and our team at Glaser Orthodontics are experts in orthodontic treatment. We are here to answer any questions or concerns you may have regarding braces, Invisalign, or adult braces in Yorktown NY, Cortlandt Manor NY, Croton-On-Hudson NY, Jefferson Valley NY, Buchanan NY, Montrose NY, Shrub Oak NY, and surrounding areas of Westchester County NY. Contact Glaser Orthodontics to schedule a free consultation today. Call now (914) 739-6400. While many think of braces as an adolescent endeavor, that’s simply not the case anymore. The employment of braces for adults in Cortlandt Manor, NY is in full swing, and they’re available for you from the team at Glaser Orthodontics! 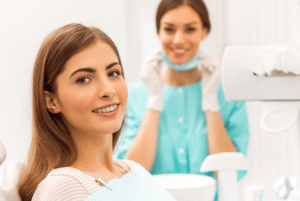 Dr. Glaser and his team provide a number of options to make braces more appealing to working professionals and adaptable to their busy lifestyle. What Kinds of Braces for Adults Are There? Traditional metal braces: These are made of metal wires and brackets that are fastened to the front surface of the teeth. You can select a variety of colors of rubber bands that hold your wires in place, and gradually the braces will guide your teeth to a perfect alignment. Clear braces: this treatment works the same way as metal braces, but instead of metal brackets, they employ porcelain or ceramic brackets. These brackets are designed to be tooth-colored, creating the effect of being “clear”. In some cases, you can receive clear wires, as well. Invisalign: the Invisalign system is comprised of a series of clear, plastic aligner trays. These trays are molded specifically to fit your teeth throughout a treatment course that is designed for your perfect smile. Every couple of weeks, Dr. Glaser will switch out your current set of Invisalign aligners for the next set, and with each new tray, your teeth will gradually shift into the smile of your dreams. Invisalign is a popular choice for many adults because the trays are virtually invisible, completely removable, and very comfortable, enabling busy adults to continue their lifestyles unhindered. How Do I Get Started with Braces for Adults? Dr. Glaser and the team at Glaser Orthodontics is thrilled to provide braces for adults in Cortlandt Manor, NY. If you have any questions or if you’re ready to get started with your treatment, don’t hesitate to contact Glaser Orthodontics today!